Whether you’re looking to lose weight, build muscle or just feel better, nutrition plays a huge role in your success. You can give your all at the gym day after day, but if your daily intake is not what your body needs, hitting your goals won’t be easy. A one-size-fits all, cookie cutter approach only goes so far. Cutting out food groups, severely restricting calories, and labeling foods as good or bad may offer progress in the short-term but under delivers in the long run. Our goal at EVF is to teach our clients sustainable, healthy habits. Learn the optimal mix of the three main macronutrients — proteins, carbohydrates, and fats — your body needs, while enjoying the foods you love. Flexible dieting is widely successful and can be implemented alongside all special dietary needs; whether you’re vegetarian/vegan, gluten and/or dairy free, or have AIP considerations, understanding and tracking your macros will help you attain your goals while adhering to any dietary restrictions. 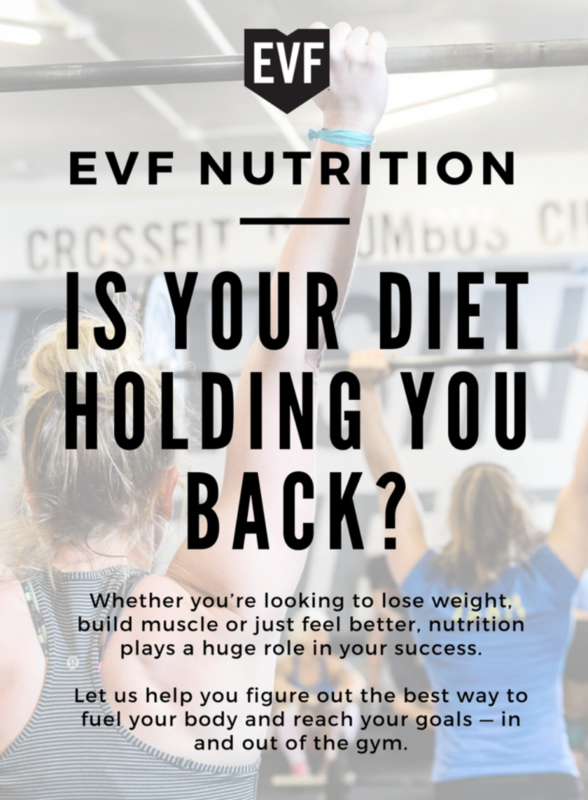 With EVF Nutrition, we start with a consultation. Meet with your coach to receive your custom nutrition profile based on your body composition, goals, activity level, and preferences, plus get all the info you need to successfully implement your new plan. Then, our on-going support options offer weekly or bi-weekly check-ins to keep you accountable. Our certified coaches monitor your progress, answer questions, provide feedback and offer support to keep you on the right track. Start with a 75- to 90-minute in-person consultation that includes a review of your current diet, your custom macronutrient profile, training on tracking your macros, and resources to support your journey. Unique Macronutrient Profile: Receive your starting macronutrient profile. Learn why your calorie and macronutrient breakdown is right for you based on your body type, metabolism, activity level, and goals. Accountability: Review your diet history with your coach, who will help you develop a plan to meet your goals. Learn about on-going support options to make your lifestyle change effective, enjoyable and sustainable. Macronutrient knowledge: Learn the importance of the major macronutrient groups, how they work together to fuel your body, and the pitfalls of under or overeating. Understand the importance of measuring, logging, and tracking your macronutrient consumption, and learn how to accurately track your food and use tracking apps. Weekly check-ins through an online summary sheet to help your coach monitor your weigh-ins and progress, making macro adjustments as necessary. Weekly Support includes useful tips to make your journey a success, plus all needed guidance and support with responses guaranteed within 24 hours. Bi-weekly check-ins through an online summary sheet to help your coach monitor your weigh-ins and progress, making macro adjustments as necessary. Bi-weekly Support includes tips to make your journey a success, plus all needed guidance and support with responses guaranteed within 24 hours. 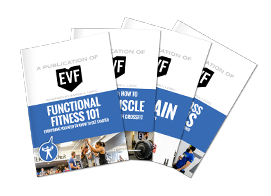 To get started or learn more, email us at colin@evfperformance.com at Columbus Circle or julia@evfperformance.com at Upper East Side.